Web Deploy 1.1 has shipped! Microsoft is happy to announce that we just shipped an update to our RTW 1.0 bits with a set of bug fixes that have been reported on the forums and through the feedback channels. You can get the new bits at at the extension page, http://www.iis.net/webdeploymenttool and in the Web Platform Installer. After 2 years of development and lots of customer feedback, Microsoft announced the Web Deployment Tool. A new temporary agent that doesn’t require you to have any services installed on your remote machines, but instead temporarily adds the agent and then removes it after sync. Allow your developers to directly deploy to the staging server without admin intervention, and lock down exactly what they can change (mark a folder as an app but not change the site’s binding). If you haven’t tried it yet, it’s worth checking out. Web Deploy is very powerful for delivering your applications. Thanks to Faith Allington and the rest of the Web Deployment team for great content on the Web Deploy Team Blog. Internet Explorer 9 – All you can eat! I have had lot of enterprises and software development companies (ISV’s) asking about Internet Explorer 9 lately. So I thought I would create a good list of resources. If you want to get up to speed on IE9, I suggest you the IE keynote and the other sessions from MIX listed below. The Internet Explorer 9 Platform Preview is here! Download the Internet Explorer 9 Platform Preview NOW! Check out the new capabilities of the next Internet Explorer, with the Internet Explorer 9 Platform Preview. You can also download the Windows Internet Explorer Platform Preview user guide and release notes. Q: Does Microsoft stand to make any money of its deepened relationship with the jQuery Foundation? Is Microsoft providing financial support to the jQuery Foundation as part of this agreement? Q: Why aren’t you working with the CodePlex Foundation? A: Microsoft is working with the CodePlex Foundation. Microsoft continues to work with the CodePlex Foundation which is a home for the very popular Ajax Control Toolkit and Orchard products. The community is actively contributing to these projects and an update is planned for the Ajax Control Toolkit as early as April 2010. Q: If you are already working with the CodePlex Foundation on similar items you plan to submit to the jQuery library, why not submit them via the CodePlex Foundation? A: Microsoft is already working on a similar project with the CodePlex Foundation. From Microsoft’s perspective, this contribution was driven solely by the intention to better enable Web developers to use the library of their choice (whether it be code created by the CodePlex Foundation or the jQuery Foundation) and improve interoperability between open source and Microsoft software. Q: Will this mean fewer resources for other Microsoft projects? A: No. Microsoft is actively working on all its projects. We also expect that other projects such as the Ajax Control Toolkit will remain active and vibrant. For example, updates and enhancements are planned for the Ajax Control Toolkit as early as April 2010. Q: What will happen to the ASP.NET Ajax Library? Are you killing it off? A: The ASP.NET Ajax Library and the Ajax Control Toolkit are part of the CodePlex Foundation’s ASP.NET Open Source Gallery. The future of these projects is decided by the CodePlex Foundation and its community. Q: What will happen to ASP.NET Ajax? Are you killing it off? Q: What will happen to the Ajax Control Toolkit? A: The Ajax Control Toolkit (ACT) is part of the ASP.NET Open Source Gallery in the CodePlex Foundation. To date, there are over a million software developers using the ACT. Further ACT enhancements and bug fixes are coming with an update planned as early as April 2010. 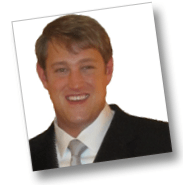 Q: Will jQuery be available as a part of Microsoft products? Q: What is the call to action for developers? What are you releasing and when? Q: Why is Microsoft making this contribution? Q: What are the benefits of Microsoft’s contributions to the jQuery community? Q: What is Orchard? Are you announcing anything today? A: "The Orchard Project" is a CodePlex Foundation technology focused on delivering a .NET-based Content Management System (CMS) application for developers to rapidly create content-driven Web sites. The Orchard Project will also deliver an extensibility framework allowing developers and customizers to provide additional functionality to the CMS through extensions and themes. For more information, attend the “Deep Dive into Orchard Extensibility for CMS Developers” session, which is presented by Renaud Paquay on Wednesday, March 16th at 1:30 p.m. in Mandalay Ballroom D.
There’s some great FREE training events coming up from AppDev. They are worth checking out if the topics are of interest. Bottomline: What is the Windows Phone 7 Backward Compatibility story? Based on all those articles, one would realistically conclude that an app written for WM7 will only run on WM7, and apps written for prior versions of Windows Mobile will also not run on WM7. His short answer was Yes. Great post from Charlie and great content around the backward compatibility story for Windows Phone 7. 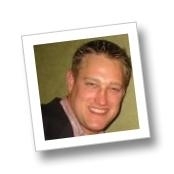 Tim Heuer’s got a great blog post on Silverlight testing tools at http://timheuer.com/blog/archive/2009/02/26/silverlight-testing-frameworks.aspx. I have had so many questions lately on how to get up to speed quickly on Visual Studio 2010 & .NET Framework 4.0. So here’s my GetUpToSpeed how-to for Visual Studio 2010 and .NET Framework 4.0. 1) Review the Visual Studio 2010 and .NET Framework 4 Learning Courses from Microsoft on Channel 9 – The Visual Studio 2010 and .NET Framework 4 Learning Course. This course includes videos and hands-on-labs designed to help you learn how to utilize the Visual Studio 2010 features and a variety of framework technologies including: C# 4.0, Visual Basic 10, F#, Parallel Computing Platform, WCF, WF, WPF, ASP.NET AJAX 4.0, ASP.NET MVC Dynamic Data. 4) Watch the 10-4 show on Channel 9 featuring the Subject Matter Experts who bring to you Metro for Visual Studio. There are 41 episodes to date and they are stellar. You can subscribe to the show and get the episodes in the media type that works best for you. I been getting a lot of questions lately about the testing story for Visual Studio 2010. Here’s a little summary and resources to get you started. Visual Studio Test Professional: This is primarily for the generalist tester who wants to create manual test cases, run these tests and view the results as part of a test plan. This SKU includes the new application called Microsoft Test Manager. This SKU can be installed quickly and easily on the test machine where the tester wants to run their tests. You can also run automated tests from Microsoft Test Manager if an automated test is associated with a test case using functionality in one of the following two SKUs. NOTE – Visual Studio 2010 is not provided as part of the Test Professional. Visual Studio 2010 Premium: This provides the features to enable a user to create unit tests and UI automated tests for an application. The tests that are created can be run from Microsoft Visual Studio 2010, the command line, Team Foundation Build, or be associated with a test case and run from a test plan using Microsoft Test Manager. 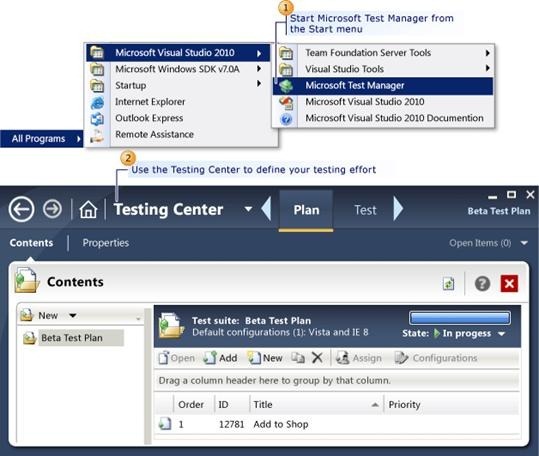 NOTE – Microsoft Test Manager is not part of the Visual Studio 2010 Premium SKU. Visual Studio 2010 Ultimate: This contains all the test functionality provided for Visual Studio 2010. It includes Microsoft Test Manager providing the functionality for planning, creating, and running test cases. It also enables you to create and run unit tests, UI automated tests, load tests and Web performance tests, generic tests and ordered tests using Microsoft Visual Studio 2010. These automated tests can be run from Microsoft Visual Studio 2010, the command line, Team Foundation Build, or be associated with a test case and run from a test plan using Microsoft Test Manager. NOTE – If you want to run load tests and simulate multiple users, you must also purchase virtual user license packs.